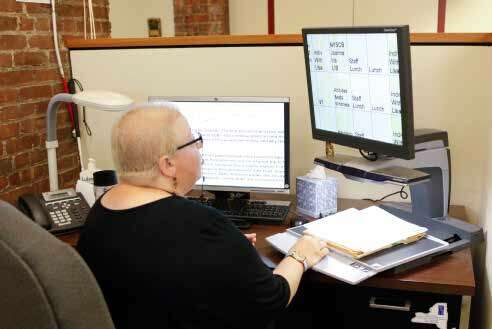 Since 2001, VISIONS has offered assistive technology services for legally blind and severely visually impaired consumers at VISIONS at Selis Manor. This is an accessible and adapted learning environment and meeting place for blind youth, adults and older persons. It is located on the main floor and lower levels of Selis Manor, a HUD 202 apartment building built in 1981 that is designed for low-income residents who are blind including wheelchair users. VISIONS does not manage the apartments. VISIONS provides services for all the tenants in the building and blind community users that travel to the building located at 135 W. 23rd Street. Assistive technology classes at the Blindline® Call Center for over a decade. Professional development workshops for placement specialists, job coaches, and IT support staff. The Tech Center is fully adapted to provide access to a full range of technology and instruction for people who are totally blind and with severe vision loss diagnosed as legal blindness. Hours of Operation: The technology lab is available for services during normal business hours 9am to 5pm, plus four evenings per week (Monday through Thursday).